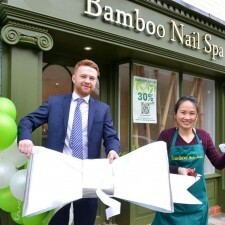 The team behind a ground breaking new project to return town centre retail units back to their former glory have unveiled the first shop - ready for a new business to take on and move in. 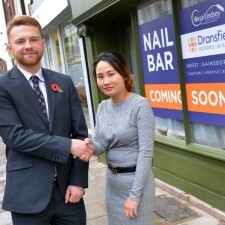 The empty shop unit on Market Street in Gainsborough has been given a makeover thanks to a unique partnership between award winning retail developers Dransfield Properties Ltd and West Lindsey District Council. The joint venture is aimed at creating a new Independent Quarter in the town which is being delivered alongside improvements to the Roseways Car Park as well as the development of the brand new Travelodge Hotel and Ponti’s Italian Kitchen Restaurant which are due to open later this year. Contractors will now move on to other empty units on Market Street to deliver the vision of creating smart traditional shop fronts with modern newly fitted interiors, which will fit a range of uses. The shop was once the decorating supplies store S & H Morris Ltd and more recently Cash Save Products but has been empty for at least five years. 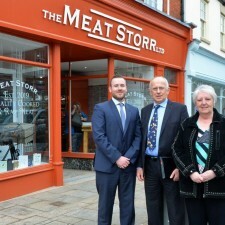 It’s hoped the town centre street’s makeover will encourage new businesses to invest in the area. The development team have delved into the history books and pored over old photographs in their bid to recreate the traditional look of the building with a contemporary, modern feel. A new authentic period shop front based on old photographs has been installed as well as three new sash windows. Liz Mayle, Conservation Officer at West Lindsey District Council has been working with the project team. She said: “The property on Market Street is within the Gainsborough Town Centre Conservation Area, with grade II listed buildings to each side. “Although 27 Market Street dates in origin from the 18th century, and has seen several phases of development, the last 50 years of change had eroded this building of any original character. Dransfield Properties owns and manages Marshall’s Yard in Gainsborough and is also developing the new town centre hotel and restaurant. Cllr Jeff Summers, Leader of West Lindsey District Council is impressed with the work which he says has made a huge difference. 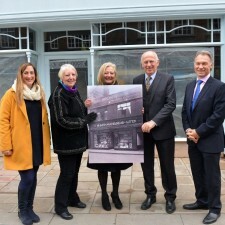 He said: “It’s absolutely marvellous what has been achieved – to see it striped back and the original styling of the shop front come back into the town. It is our ambition to transform the whole of the town centre through heritage-led regeneration as described within the Gainsborough Heritage Masterplan. Pictured left to right are: Alison Shipperbottom from Marshall’s Yard, Cllr Sheila Bibb, Executive Director of Commercial and Economic Growth, Eve Fawcett-Moralee, Cllr Jeff Summers and Executive Director of Resources Ian Knowles from West Lindsey District Council. Also attached is a photograph of the former Cash Save Products store.